Download all of Mike's games and enjoy the free demo modes! "Mike's 3-Pack" when you register to unlock all three games for the price of two! Mike's Cards Lite! 7 great card games, and it's 100% FREE! Download Mike's Cards Lite - it's free! Download Mike's Cards Lite v2.0.1 - 7 great card games 100% FREE! Want big gorgeous cards? You got 'em! "An absolutely incredible set of card games." "far superior to anything else available." "left me with my mouth hanging open the first time I played it!" "Simply put, Mike's Cards is the best card game suite out on the market today." "The last card game you will ever try." "Have played many of the other card games. But this one is the top." 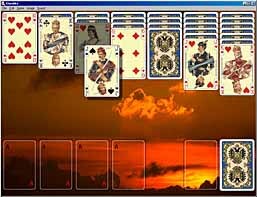 "Easily the best solitaire package out there for either PC or Mac. Thanks!" "it has to be the most spectacular solitaire game I've ever come across." "It's the most realistic and flexible solitaire around"
Mike's Cards Copyright (c) 2000-3 Mike Sedore. All rights reserved. Mike's Cards and the Mike's Cards logo are trademarks of Mike Sedore.